The Corolla Coupé is obviously a product of the '80's when digital was hip and happening. And because of that Toyota developed a very nice digital instrument cluster that was available as a option in the GT Apex models in japan. This must be the ultimate '80's gadget and sort of a must have in this car. The standard instrument cluster that was in the car when I bought it didn't really appeal to me. I like the dashboard that was in my EUDM Corolla hatchback. It looked clean, nice and very thought through. The instrument cluster that was in the coupé however looked a little cheap and it was a bit of a mess if you ask me. Warning lights all over the place, the water temperature and fuel gauges behind squared openings cut from the main panels and those panels ware not one piece but there was a clear joint running straight down the middle. Not Toyota's best work if you ask me. 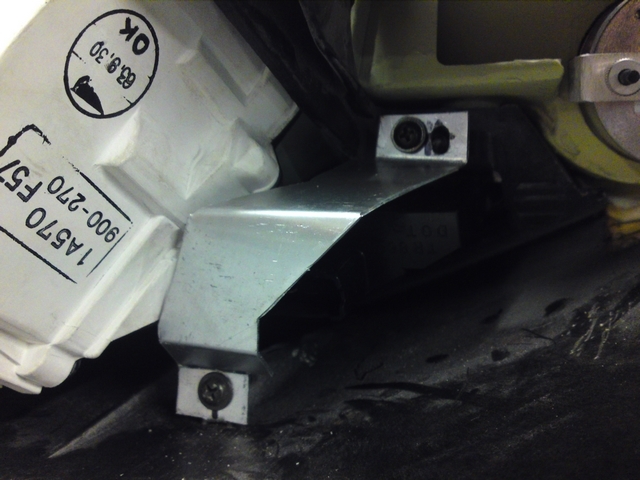 And because this was a USDM car, the main speed was indicated in MPH, with Km/h indicated in a smaller, orange indication. But although I haven't driven it on public roads yet, I think that could be confusing because you need to think twice to see how fast you are driving. So it's a added bonus for the digital instrument cluster to indicate in Km/h. It might just save me from some speeding tickets. A friend and fellow Corolla Club member with who I regularly discuss idea's about the project (He's just as big of a E9 nutcase as I am) imports rare Toyota parts from Japan on a regular basis. And he had also shipped over a digital instrument cluster for the coupé. Since I'm the only one he knows with a coupé he donated a digital cluster to me! Awesome and I can't thank him enough! Thanks Peter! Now I had to figure out if I could use it in my car as it is a RHD cluster and my car is LHD. When it's all up and running, this is how the digital instrument cluster should look like. And the digital instrument cluster how I received it. My luck in this case is that in contrast to the the dashboard in other E9 models, the dashboard of the coupé in pretty much symmetrical in shape. So although it is a RHD cluster, it should still fit my LHD dashboard. The bezels that hold the cluster in place unfortunately weren't in the same place and would have to be modified. 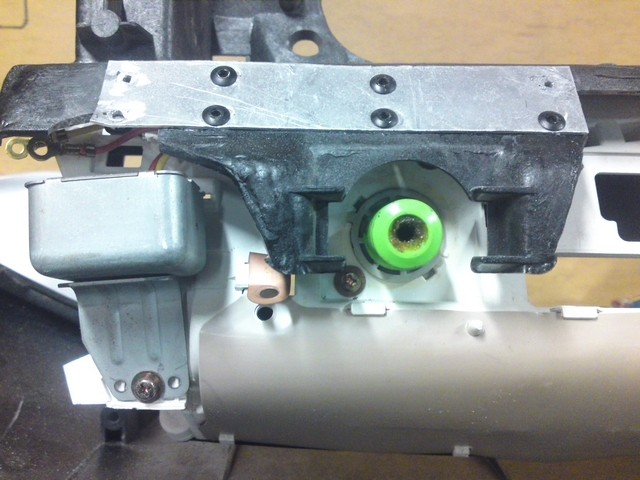 To start those modifications, I had to take the cluster apart to work on the housing without damaging everything that's inside. The instrument cluster fits the LHD dashboard nicely. 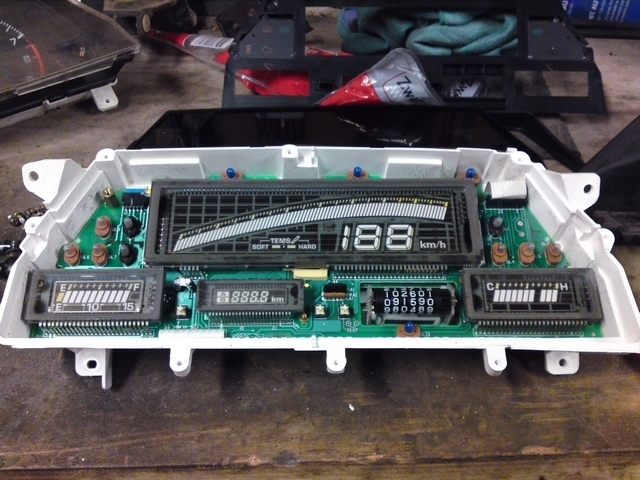 The internals of the instrument cluster. When I checked and measured it all out, I saw that one of the bezels could be used, but the other 3 would have to be altered. So I cut those off and I will replace them with aluminum bezels of my own making. They fill be glued in place with superglue at first and I will add a few rivets to be sure they won't come loose. Measuring out where the new bezels will have to go. In the dashboard itself, there is a metal bracket where the instrument cluster is screwed into. 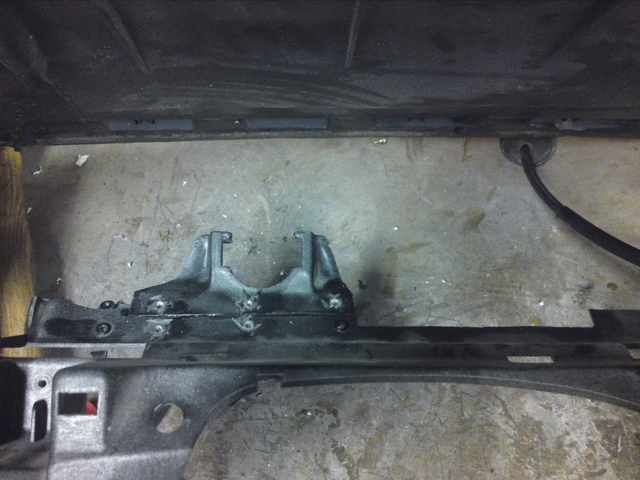 But with this instrument cluster, that bracket was in the way. So I had to also take that one out and make a new one as well. 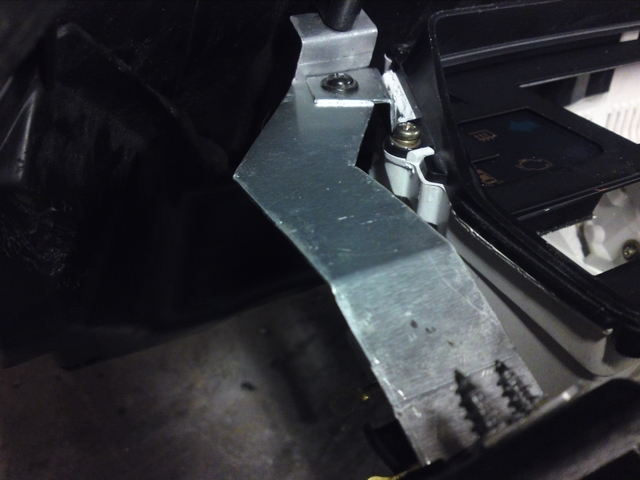 The new mounting points for the instrument cluster..
Well then, the instrument cluster could now be screwed securely into the dashboard. 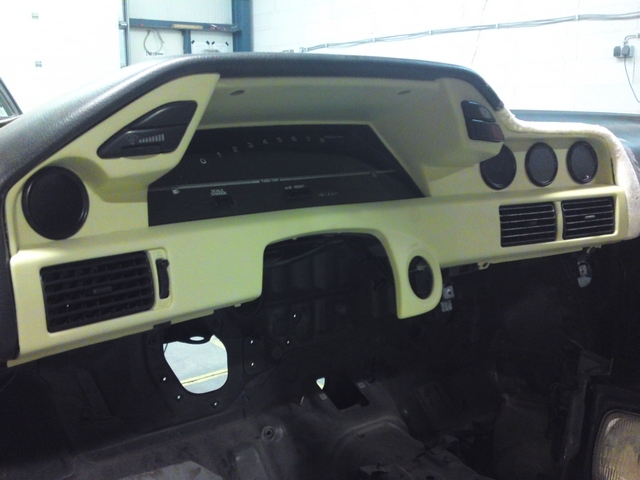 But there are a few things that will have to hook up to the instrument cluster. 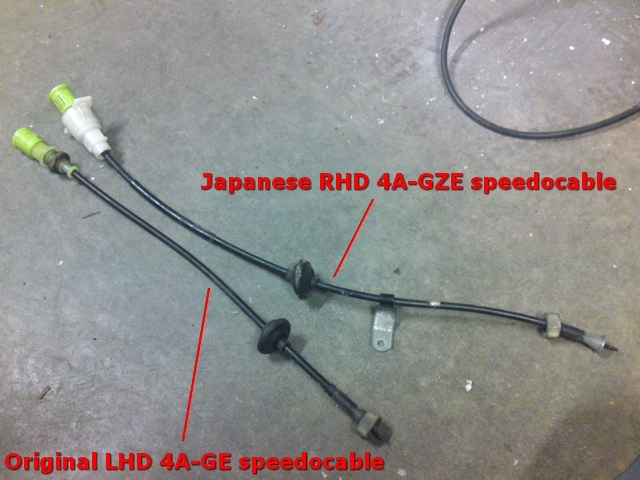 One of those is the cable for the speedo drive. The speedo and odometer are driven by a cable that's hooked up to the back of the instrument cluster and comes directly from the gearbox. But it's pretty hard to get behind the instrument cluster to hook up or undo the connection of that speedo cable on the instrument cluster as there is only limited space behind it and little room to move things around. 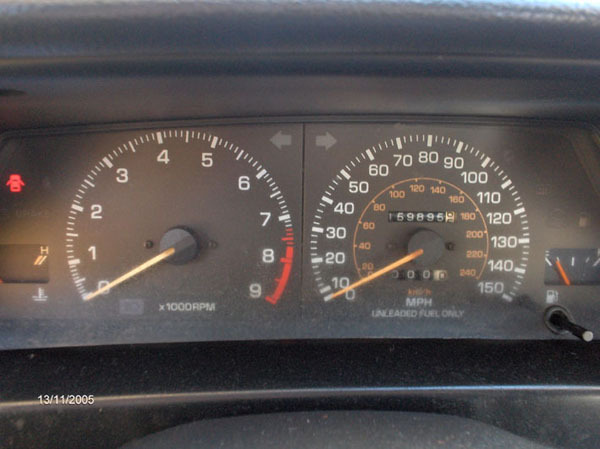 So in the original dashboard with the original instrument cluster, there was a bracket holding that speedo cable connection in place so the cluster would simply click on to it. 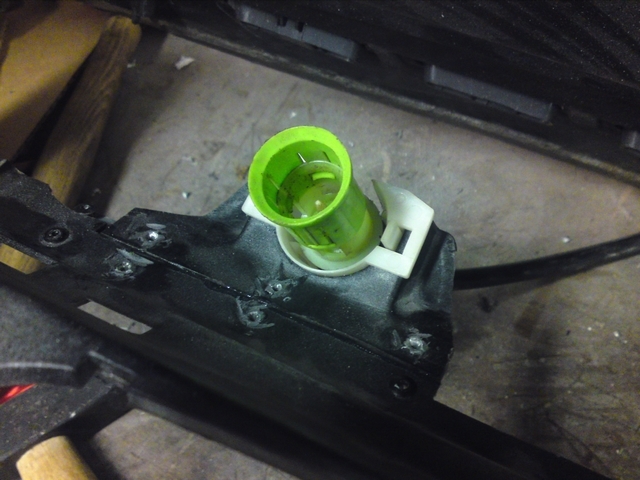 I really liked that as I have had trouble hooking that cable up in my hatchback that didn't have that bracket. 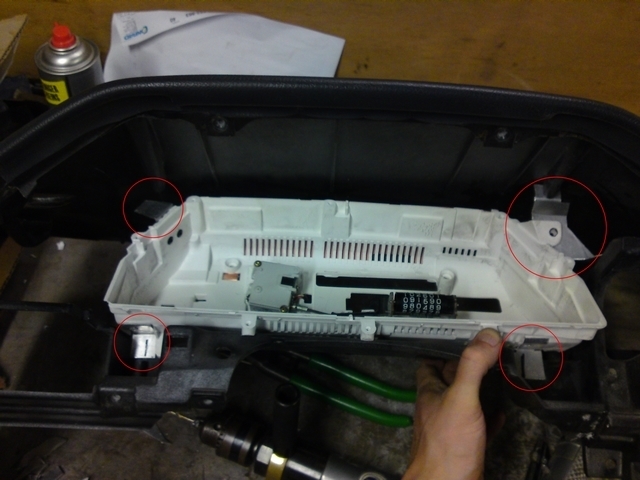 So I wanted to retain that bracket and use it with the new instrument cluster. 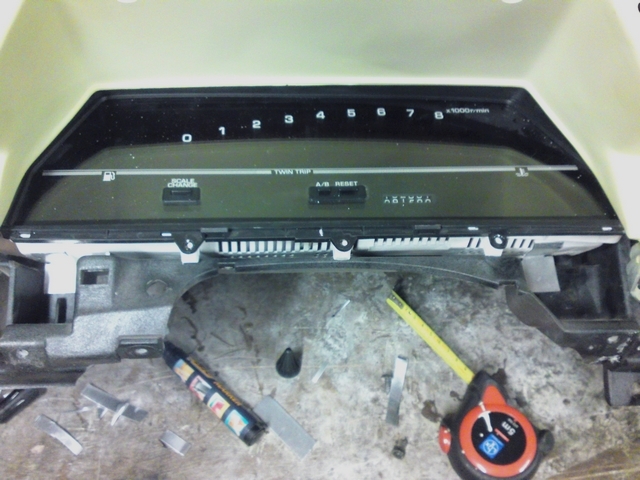 But of course, the hookup on the instrument cluster was in a other place than on the original cluster. So if I wanted to use that bracket, I would have to move it over a bit. The connection for the speedo cable. That just left me with one little problem. 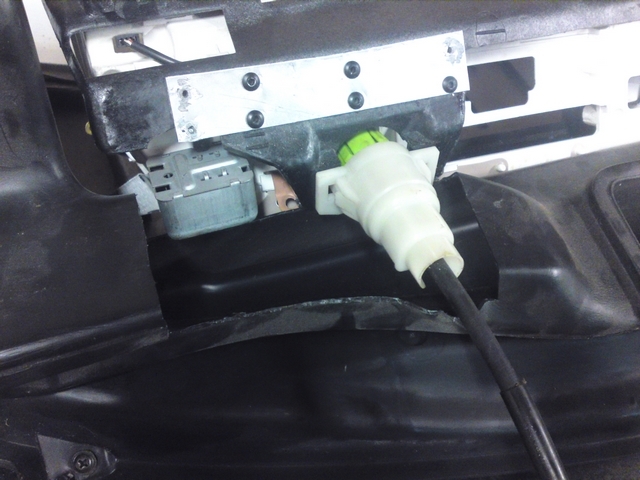 Because the cable had to move over a little, there was a very good chance that the cable that was in the car would now be to short. But this is a pretty particular sort of cable. You can't just go to a hardware store and pick one up. So this was turning out to be a real headache. Until I remembered that my GT-Z frontcut came with it's own instrument cluster. The frontcut was pretty complete when I got it, so there was a chance that the speedo cable was included too. 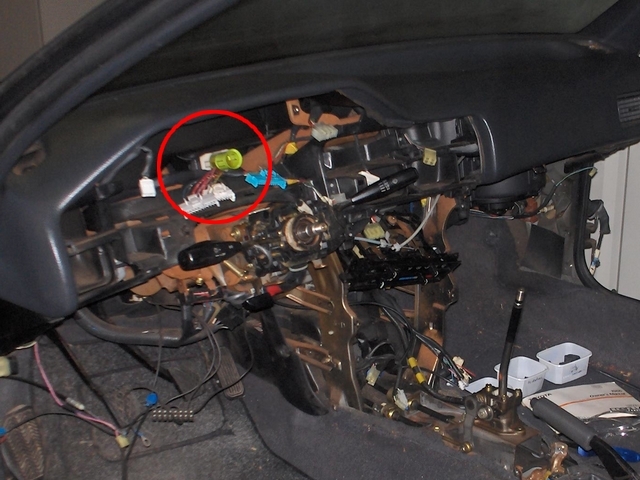 That was a RHD car and since the engine and gearbox had the same position in both RHD and LHD car, the RHD cable would have to be longer to reach the instrument cluster on the other side of the car. That might just solve my problem as well. So I rummaged through my little magazine with Corolla parts a bit and eventually found the speedo cable from the frontcut. When I compared both cables, the RHD cable turned out to be a bit longer and should be more than long enough to use in my car. Another problem solved! 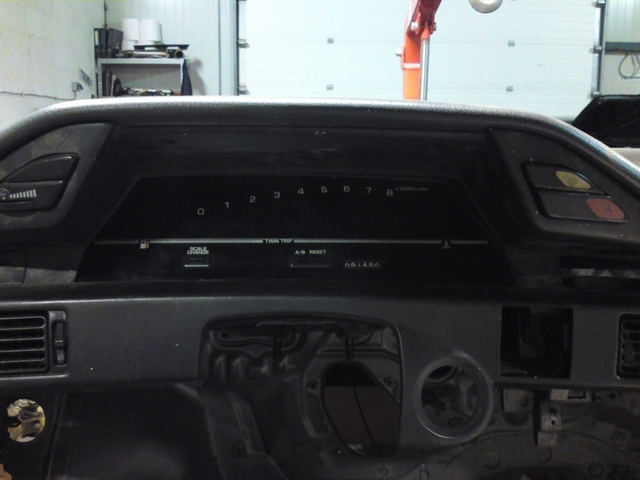 With that, the digital instrument panel was ready to be installed. I haven't actually seen it light up, as it all have to be rewired and I haven't got around to that yet. So that will be done later on.